An ENTIRE Thanksgiving Dinner (turkey breast + gravy, candied sweet potatoes, dressing, and parmesan brussels sprouts) all made on two sheet pans. Right above this text is a quick (2 minutes, 7 seconds) video overview of this Two Sheet Pans Thanksgiving Dinner! Below are helpful tips and the full recipe. Enjoy! Earlier this year I shared an entire Easter dinner all on two sheet pans and have loved seeing all the many re-creations! I had so many requests for a similar concept for Thanksgiving dinner, that I’ve worked hard on perfecting this two sheet pan Thanksgiving dinner and I’m very excited to share it with you! I’ll add a disclaimer at the top of this post that this Thanksgiving dinner recipe is more sensitive to exact quantities, products, and cooking temps/times than a typical recipe is. 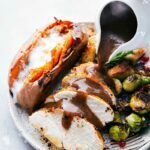 I’ve tested this recipe several times and have it pretty dialed in, but in order to get perfect results you’ll want to follow exact pounds/sizes in the recipe (especially for the turkey breast) and make sure your oven is calibrated. Let me also add that the video above doesn’t include every step in the process (it’s aimed at being a brief overview), so make sure you carefully read through the instructions before starting. I hope you LOVE this simplified Thanksgiving dinner! Find a 6-7 pound turkey BREAST. Purchase one that is bone-in and skin-on. Once you have your thawed turkey you can add a wet or a dry brine to your turkey to give it a bit more flavor. Before putting the turkey on the sheet pan, you’ll want to remove the two breasts from the bone. Once the turkey is in the oven, have a food thermometer ready. You’ll want to test the turkey multiple times to make sure you don’t over or under-cook it (no-one likes dry turkey!). A turkey is done when the thickest part of the turkey breast reaches 165 degrees F. I pull my turkey out at 160 degrees as it will cook those extra 5 degrees as it’s sitting. Prepare the gravy. Follow the directions on the included gravy package, if your turkey came with one, or make some from scratch! I found a great recipe HERE. 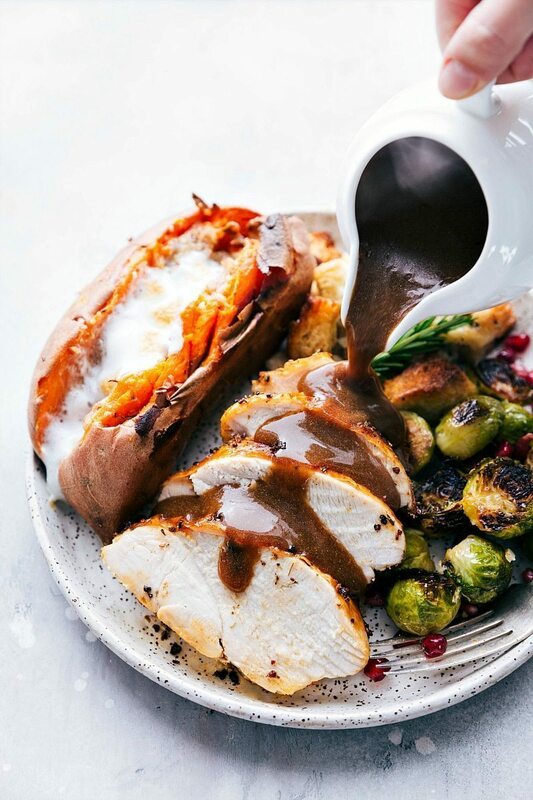 If you’re looking to save some time, pre-made turkey gravy is a great option. I like McCormick’s Simply Better Turkey Gravy* best. *I’m not receiving any compensation for mentioning specific products in this post – I do this only because these are my favorite products! The secret to avoiding soggy dressing is to use stale, dried-out bread. But even with stale bread, I still like to toast it in the oven to ensure it’s completely dry. For this recipe I toast the bread at 250 degrees F for about 20 minutes. It’s optional but really ensures a good dressing. Use fresh herbs. I like to use a generic packet of poultry herbs, which include spices like sage, rosemary, and thyme. Poultry herbs are found in the produce section of the grocery store near the fresh-cut herbs. Just one poultry herb packets is enough for the dressing. I also add a bit of fresh parsley in the mix as well. You can assemble the dressing ahead of time! The dressing can be completely assembled and refrigerated overnight or up to 24 hours (cover it tightly in the fridge). If you are baking the dressing right from the fridge, expect to add an extra 10 or so minutes to the baking time. Use fresh Brussels sprouts (look for outer leaves that are dark green and vibrant and stem ends that aren’t dried out). For a quick prep time you can buy pre-washed brussels sprouts. But if not, prep those ahead of time by removing any dead leaves and washing them thoroughly. You want the brussels COMPLETELY dried before starting this dish. Cut off and discard the stem end. Pull off and discard the outer leaves of the brussels sprouts (just the first layer OR if you want a less intense brussels sprouts flavor, you can peel off more leaves until you get a softer green). 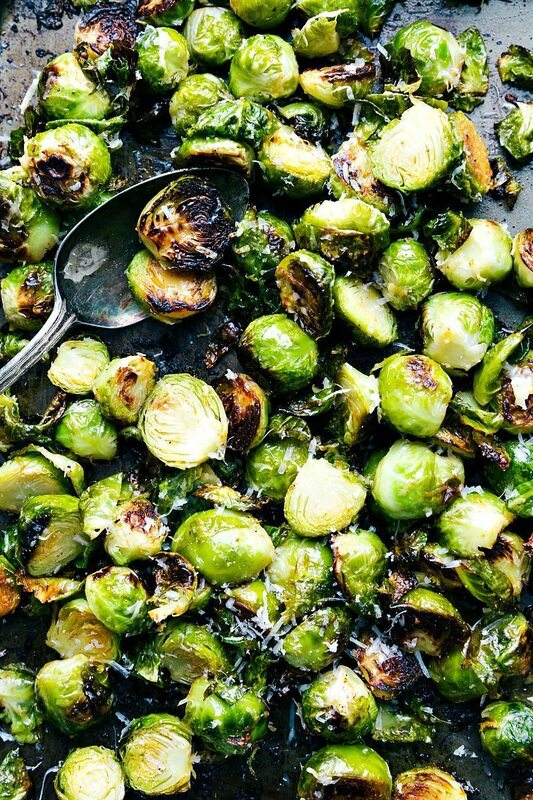 Halve the brussels if they’re large but keep small brussels their full size. Serve roasted Brussels sprouts hot or warm – they will keep delicious and warm for up to 30 minutes if you cover them and set them in a warm place. I use brussels in this sheet pan meal, because it allows for a little variance in cooking the other things. (They’ll stay warm if everything else needs a little longer). Last but not least, we’ve got the candied sweet potatoes on the side of the brussels sprouts. To cook full sweet potatoes in the oven it can take well over an hour. To take a short-cut, we’ll first cook them in the microwave and then finish the process in the oven. Prick the sweet potatoes all over with a fork. These small holes all over the sweet potato allows the steam to escape as the potato cooks. This also keeps the sweet potato from exploding and making a mess all over the microwave. You’ll want to prick the potatoes about 8-10 times all over. (You only need small holes for the skin — don’t worry about piercing the potato all the way through). Take a cold damp paper towel (that has been wrung of excess water) and wrap the sweet potato in the paper towel loosely. This will help provide a “steaming effect” and keep the potato moist with a softer skin. To get the delicious crispy and candied sweet potatoes, we’re going to cook the potatoes halfway in the microwave (about 6-10 minutes depending on size PER sweet potato) and then roast for 10 minutes. We’ll remove these potatoes and then add the candied topping and cook it for another 15-20 minutes which should be done right as the time the brussels are finished. NOTE: Before starting, read through this entire recipe. It will help with timing and flow. Essentially you'll be making the dressing and turkey first because that cooks for 30 minutes alone. While that is cooking you can prepare the second sheet pan (the brussels and sweet potatoes) so it's ready to go in with the first sheet pan and cook for another ~30 minutes. Preheat the oven to 250 degrees F. Cube the bread and put it on a tray in one even layer. Bake for 20 minutes, remove, and set aside. (START microwaving sweet potatoes as you start this prep; see instruction #2 under PAN TWO: Brussels and Sweet Potatoes). Position the oven racks to the upper and lower thirds of the oven and preheat to 375 degrees F degrees. Line both sheet pans with parchment paper (MUCH easier clean-up). Use foil to make a "bed" for the dressing -- fold it up so it's like a separate pan on the pan. On one side of the first sheet pan, place down the "foil bed" for the dressing. In a very large bowl, add the egg and whisk it until smooth. Melt 4 tablespoons butter in a large nonstick skillet over medium heat. Add the celery and onion and cook, stirring occasionally, until softened, about 5 minutes. Add the chicken broth, parsley, rosemary, sage, thyme, 3/4 teaspoon salt, 1/4 teaspoon cracked pepper and bring to a simmer. Turn off the heat and set aside. Add the dried bread cubes to the egg mixture in the large bowl and toss. Add in the celery-onion mixture toss gently to combine. Pour this dressing mixture into the prepared "foil" tray. Cut the remaining 2 tablespoons of butter into small pieces and place evenly all over the dressing. Cover the dressing with foil. Check the post for directions on properly thawing the turkey breast and removing the two breasts from the bone. Do NOT remove the skin. Wash and pat dry the breasts. Add salt (don't add any more salt if you've done a dry brine) and pepper to both breasts -- make sure to get it above and below the skin. Melt the butter and mix it with all of the seasonings (again eliminate salt if you've done a brine) until you have a thick mixture. Rub this mixture generously over the breasts -- especially under the skin. Rub it on top of the skin as well and then pull the skin to completely cover (or as much as possible cover) the meat. 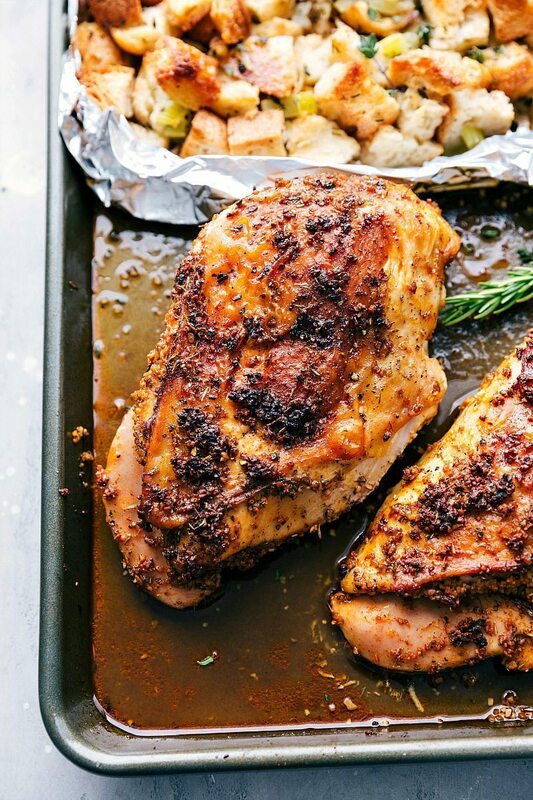 Place these two prepared breasts on one half of the lined sheet pan. See cooking directions under "cooking the two pans"
Microwave the sweet potatoes: scrub the potatoes until cleaned (leave skin on). Using a fork pierce the potatoes evenly all over, about 8-10 fork pierces throughout the skin. Wet 4 paper towels in cold water and then wring out the extra liquid. Wrap each potato loosely in the paper towel. Place each potato (one at a time*) in the microwave and microwave for 5 minutes at full power. Remove and turn the potatoes onto their other side and microwave for another 3-5 minutes or until potatoes are tender enough to cut open (but don't cut them yet). Remove and allow to cool. On one side of the SECOND tray: place the brussels sprouts, olive oil, salt, pepper (I use about 1 teaspoon salt and 1/2 teaspoon pepper), and garlic powder. Toss on the tray and then spread into an even layer (if they are on top of each other they will steam instead of roasting) Place the mostly cooked through potatoes on the side of the tray. See cooking directions under "cooking the two pans"
To make the sweet potato streusel: In a large bowl (quickly rinse out the dressing bowl and use that), mix the room temperature butter, brown sugar, and flour together until it's crumbly-looking. Add the cinnamon, salt, pecans, and 1/4 cup marshmallows. Stir until ingredients are combined and set aside. NOTE: Avoid opening the oven more than the recipe indicates as that really cools it down and will take everything longer to bake. When you do open the oven be very quick to close it up again. Put the sheet pan with the turkey breasts and stuffing on the rack in the upper third of the oven and bake for 30 minutes (remove the foil from the dressing at the 30 minute point). 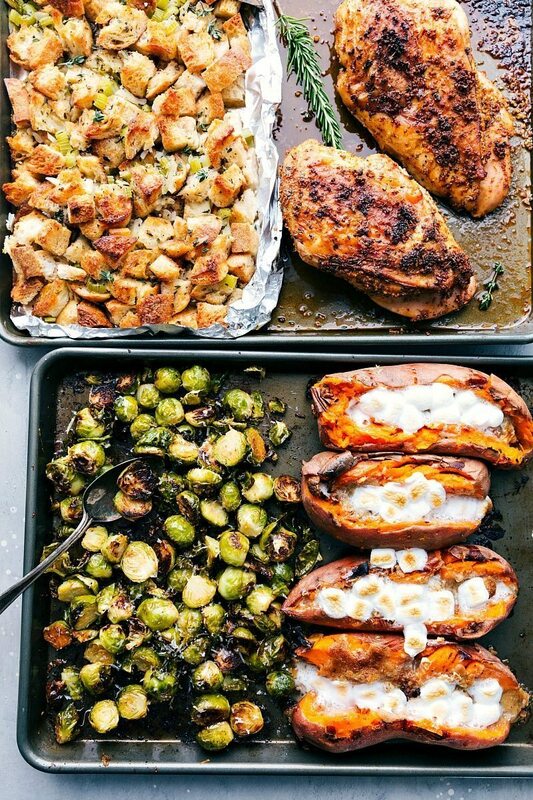 While the first tray is baking, you can prepare the second sheet pan of brussels and sweet potatoes. After 30 minutes, put the second sheet pan on the rack in the lower third of the oven. Cook 10 minutes. Meanwhile, prepare the streusel for the potatoes (See step #3 under PART TWO: Brussels and Sweet Potatoes). After 10 minutes, remove the bottom sheet pan from the oven and rotate the top turkey pan (keep in the oven). 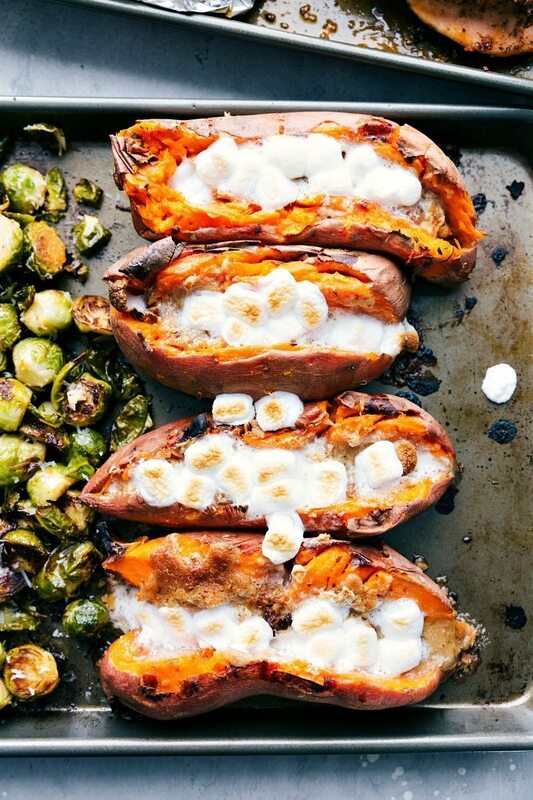 Remove the sweet potato pan and add the remaining marshmallows on top and add parmesan to the brussels sprouts (unless you want to use pomegranate arils instead). Add to the oven for another 2-4 minutes or until the marshmallows are bubbly (watch closely) and the parmesan is melted. Transfer the turkey breasts to a cutting board to rest at least 10 minutes before slicing. Slice the turkey breasts and return them to the sheet pan with the stuffing to serve. Serve with gravy, dinner rolls, and cranberry sauce as desired. *You can microwave more than one potato at a time but note that it will take 2/3rds as long. So, for a single potato that would take 10 minutes it will take 16 minutes for two. I like to use microwave one potato at a time to ensure each is evenly microwaved. 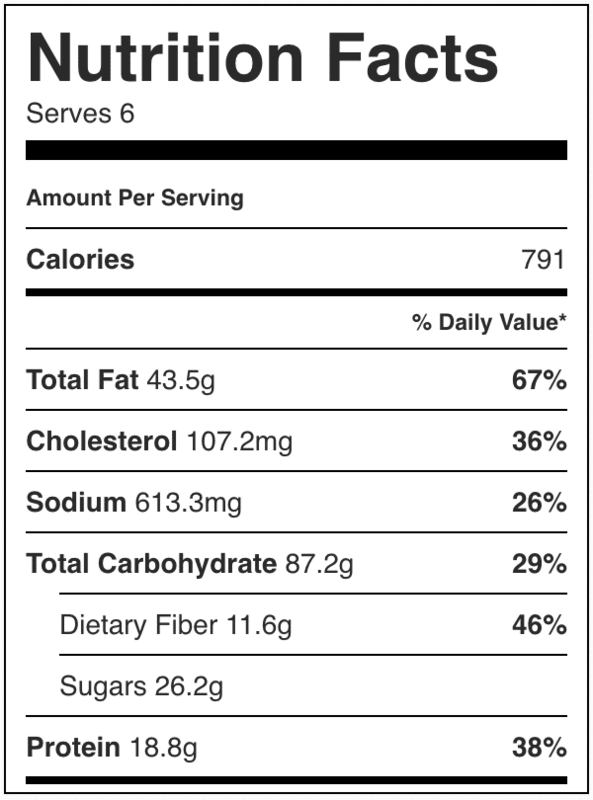 Nutrition Facts for this Thanksgiving Dinner does not include the gravy, cranberry sauce, or dinner rolls. It also assumes all of the ingredients will be split equally into six servings. Thank you for minimizing the quantities; it’s two of us and this is just made for us ! Thank you so very much ! This is such an awesome post! Thank you for taking the time to create this! 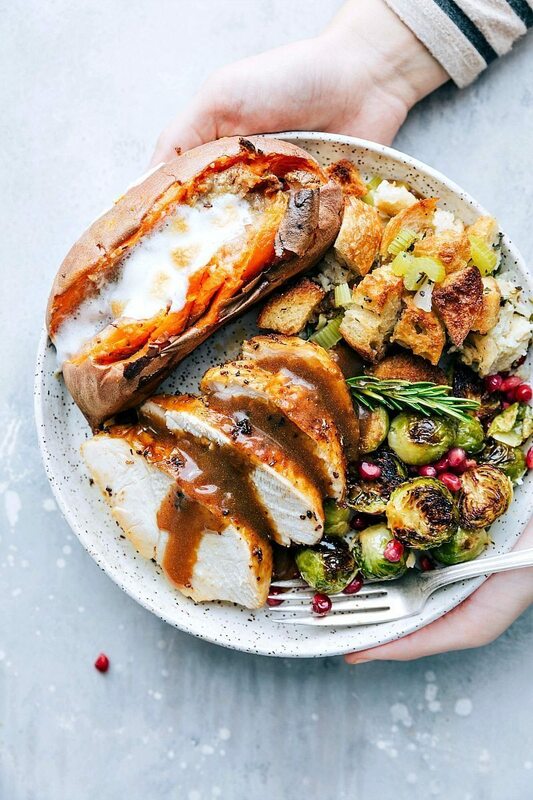 Hi!I’m so in love with this recipe I’m excited to try it this year…One question…You started with putting the turkey breasts in first for how long should they cook before adding the dressing to the first sheet pan,also can I just buy turkey breast with no bone in and skin on? Thank you so much for taking the time to put together this recipe! I know it will be very helpful. I’d like to double this on multiple sheet pans (double oven) on convection. Any guess as to the temperature? Brilliant idea! It’s just me my husband and 2 small boys this was so perfect for us. Thank you. Initially you put the second pan on the lower rack, with nothing on it? Is this to pre-heat it?